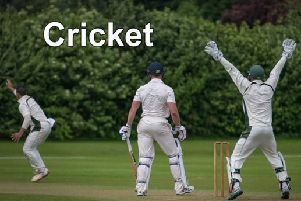 Bracebridge Heath increased their lead over Woodhall Spa at the top of the Readers Lincolnshire ECB Premier League to seven points, picking up 20 against Louth while their challengers fought out a winning draw against bottom side Spalding which brought them 14 points. Nuwan Jayasena was the pick of the weekend’s bowlers, taking eight Woodhall wickets for 41 as the home side were held to 202 all out, Jack Luffman and Sam Evison each with half centuries. Spalding then reached 168 for eight at the close to claim a valuable 10 points. Brett Houston hit 110 off 101 balls for Bracebridge and Vikram Atri made 72 as the leaders recorded the highest total of the day with 301 for nine. Five of the wickets fell to Amila Wettasinghe and his fellow Sri Lankan Himesh Silva then took four to help bowl Louth out for 127. Emile Kriek made the day’s second century, hitting 104 for Market Deeping in their 26 run win over Sleaford. Deeping finished on 219 for nine and Kriek went on to take four wickets as Sleaford were bowled out for 195, Oliver Burford top scoring with 47. As the second half of the season gets under way, the top two are opening up a gap, with third placed Deeping now 33 points behind Woodhall Spa. Four points behind Deeping are Bourne who fought out a tight game at Lindum, winning by just two wickets to go two points ahead of Sleaford. Alex Hornsby made a welcome return to the Lindum side after early wickets had fallen, hitting 71 and sharing a stand of more than 100 with Geoff Middleton as Lindum made 177 for nine. Bourne reached 91 for two but then found themselves 106 for six before Tom Dixon (35) and Sam Evison dug in to add 63. Two more wickets fell but Evison saw his side to victory with an unbeaten 28. Down in the relegation area, Grimsby slipped into the bottom two after losing their local derby against Market Rasen. Matt Rutherford set his side on course for victory with seven wickets for 24 runs as Grimsby were bowled out for 126, Michael Brown top scoring with 39. Rasen went on to win by six wickets, Dale Christie hitting a quickfire 34 that included four sixes. Grantham moved above Grimsby and to within five points of Skegness after beating the seasiders at Gorse Lane despite being bowled out for a modest 166. Number 10 Joe Peck was the highest scorer with an unbeaten 27 and Brendan Young and Norman Brackley each took three wickets. Skegness then reached 94 for two but from here wickets fell steadily and despite Jamie Epton’s 50, the visitors were all out for 145. Results: Bracebridge Heath 301-9 (Houston 110, Atri 72, Wettasinghe 5-84), Louth 127; Grimsby Town 126 (Rutherford 7-24), Market Rasen 127-4; Grantham 166, Skegness 145 (Epton 50); Lindum 177-9 (Hornsby 71), Bourne 178-8; Market Deeping 219-8 (Kreik 104), Sleaford 195; Woodhall Spa 202 (Luffman 57, Evison 55, Jayasena 8-41), Spalding 168-8 (Hollingworth 61no).